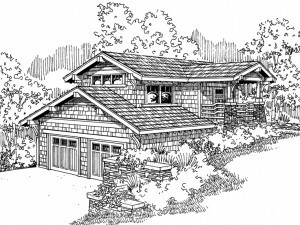 Well suited for a sloping lot, or rugged terrain, this Arts and Crafts styled carriage house plan tucks neatly into any hillside. The exterior displays stylish details like sturdy porch columns atop stone pedestals. 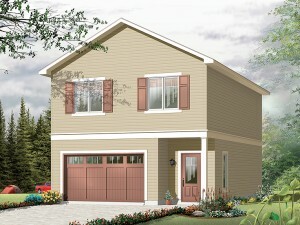 The living quarters are situated on the main level with an 880 square foot, side-entry, drive-under garage positioned on the lower level. You’ll appreciate the extra deep bays of the two car garage, ideal for parking oversized vehicles or storing a boat. Two overhead doors and a service entry provide convenience. Now take a look at the living space. Exterior stairs connect to the studio apartment from the lower level or you can enter on the main floor from the covered front porch. Inside, the efficient kitchen connects with the living area creating an open and flexible floor plan. A full bath contributes to functionality. Special features include a prep-island, dual storage/coat closets at the entry, vaulted ceilings and large, sunny windows filling the space with natural light. 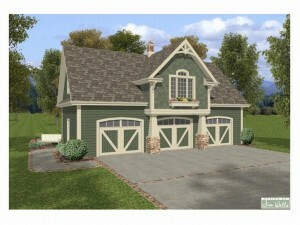 The perfect office for a home-based business, an entertainment space for special occasions or private living quarters for the nanny or weekend guests, this unique carriage house plan is a wonderful addition to any Craftsman home.